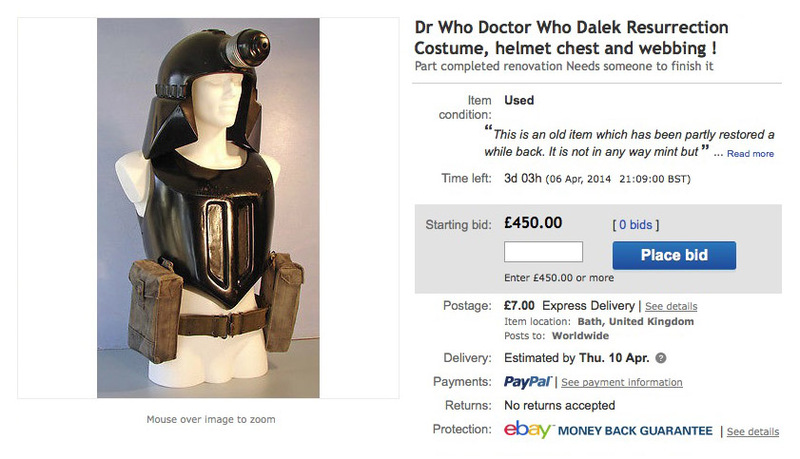 If you’ve always wanted to dress as a Dalek Trooper from Resurrection Of The Daleks, now seems to be the time to live your dream! Here is an item I bought in the early 1990s from Stuart Evans, producer of the OOP Sevans Models kits. I think it’s an original screen-used costume but I can’t be 100% certain. Interestingly, a couple of years after I had it, I found a note in one of the chest pockets stating ‘Jeff ring Maria in Make Up ASAP’. I’ve always meant to check out the credits of Remembrance of the Daleks to see if this corresponds but I never have. 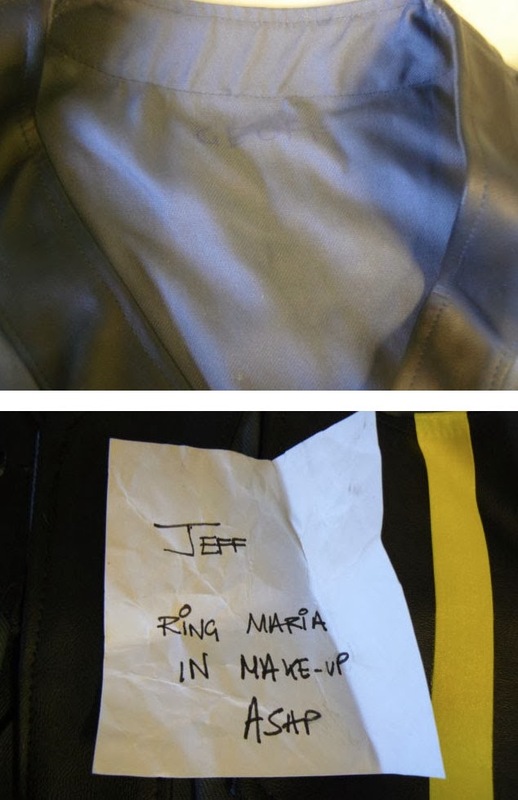 There is also ‘Geoff’ (different spelling) written on the inside of the costume. I don’t think the gloves are original (they’ve begun to deteriorate so I’m providing a second set) and the waist webbing was added by Stuart. 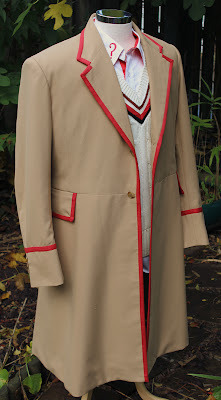 You will receive:- Dalek Trooper suit/overall-grey webbing-two pairs of black rubber gloves-correspondence letters. 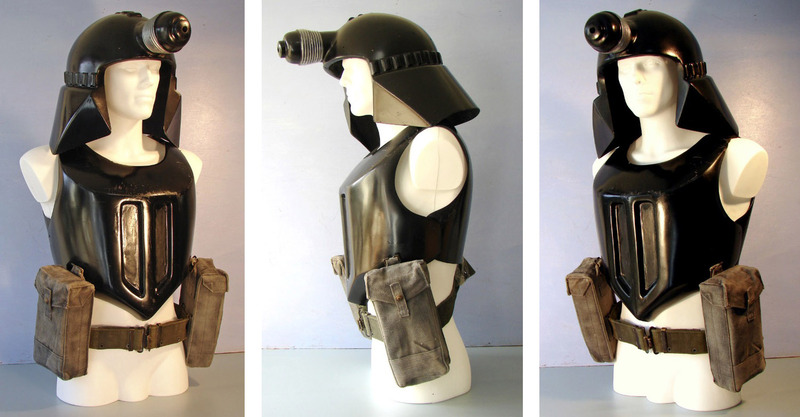 The set you see here was purchased from an auction somewhen in the early 1990s as part of a complete costume. 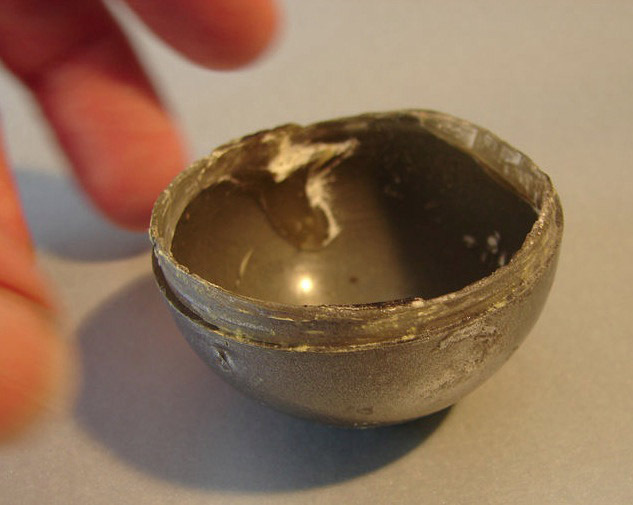 The owner then allowed his children to play with it and resultingly the fabric bodysuit was damaged beyond his abilities to repair it and many of the half ball details originally positioned around the base of the helmet were either smashed or broken off. Several years later he decided to try and reclaim the remaining parts and lavish some care on them as part of a smaller display. What we have now are three separate items. This is made from fibreglass and is good quality and of thick construction. 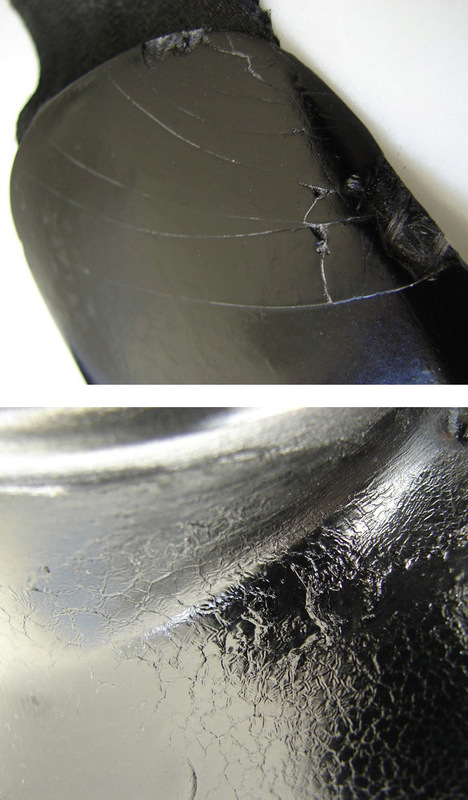 The original liner and the screws that held it in place are no longer present as a foam insert had replaced it for wear by a child. The owner has at some time removed all of the half balls that went around the base, chipped off all the hardened glue, sanded the areas down and given the lower section at least, a respray of gloss black paint ready to accept a set of replacement half balls. It is made from two pieces, a front half with inset panel areas and a rear half which comes down to kidney level and while contoured to fit the body, is otherwise featureless. The two pieces are joined at the shoulders by lengths of what appears to be black car safety seat belt material which has been attached with more fibreglass strips. There appears to be only one application of paint on this. It is quite badly scuffed at the top front. There are also two strips of paint missing in the bottoms of the recesses where a coloured material was once glued. There is a green army web belt with a brass clip buckle and a set of grey canvas ammunition pouches of matching design. 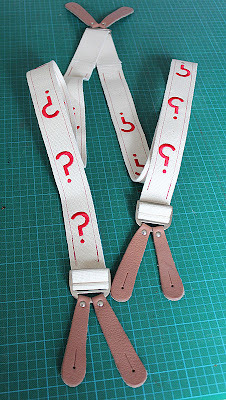 The belt is currently set at about a 34 inch waist but is adjustable, to what maximum I do not know. 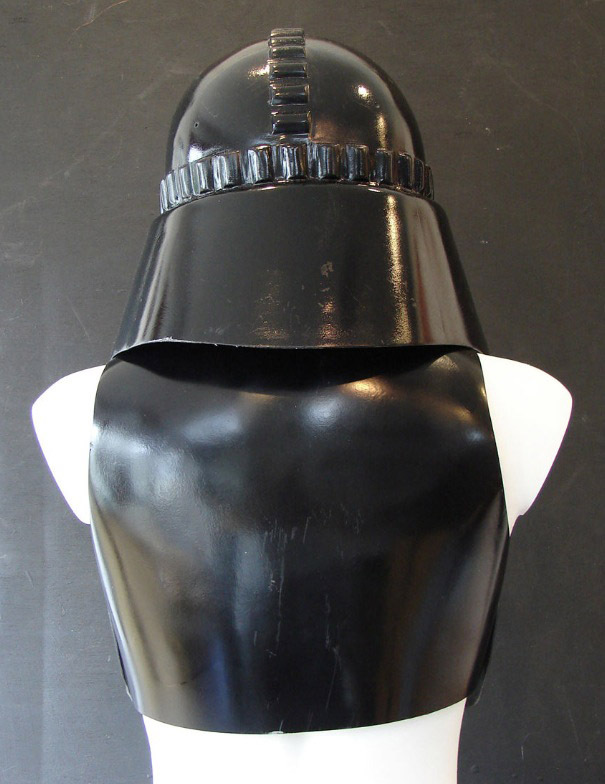 The helmet has been resprayed at least on its lower section. This was done a very long time ago and the paint has built up a really good aged patina since then ! It has also picked up wear and tear marks from storage. There are a couple of areas with the kind of fine surface crackling old paint gets. Also a few minor knocks to the fibreglass but absolutely nothing to detract from the piece and all entirely what would be expected of something this old. 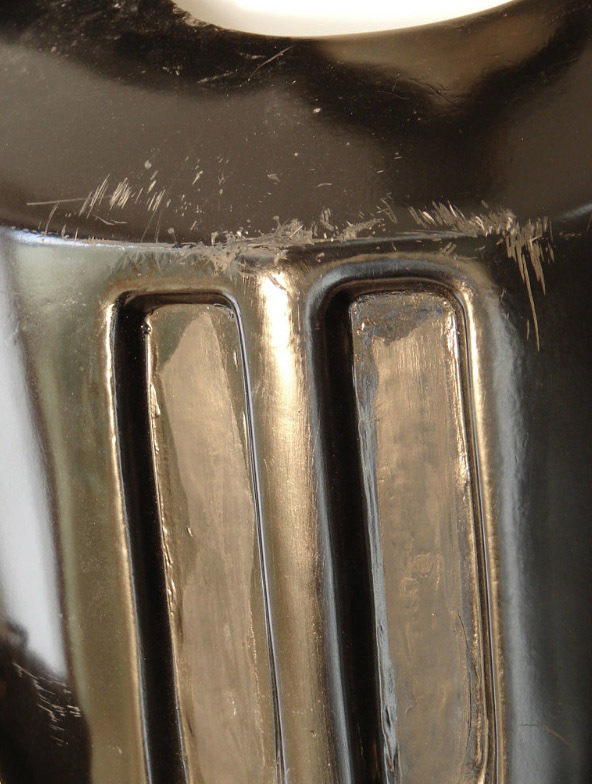 The chest is scratched as shown and also on the left shoulder of the front panel there is stress cracking due to age and usage. The webbing appears to have been given some intentional ageing down treatment at the time to make it look battle used. The previous owner had intended to bring this back to its full glory and had someone make a set of replacement half balls for the helmet based on one of his originals. With this set you will receive the original half ball which came from the costume, it is hollow and has a stepped in lower edge, it looks very much like a candy holder from a bubble gum machine. It is quite rigid plastic and you can see why these things broke and fell off so easily. 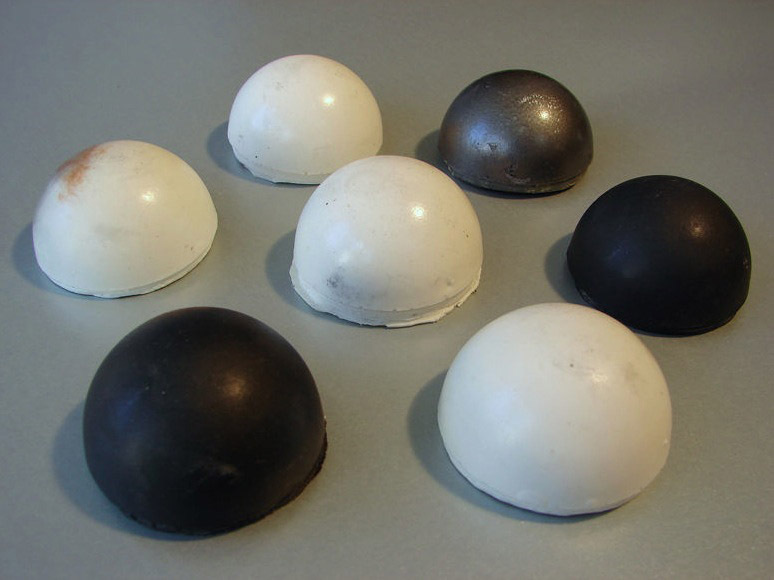 There are a further six replacement hemispheres cast solid in a hard wearing resin. 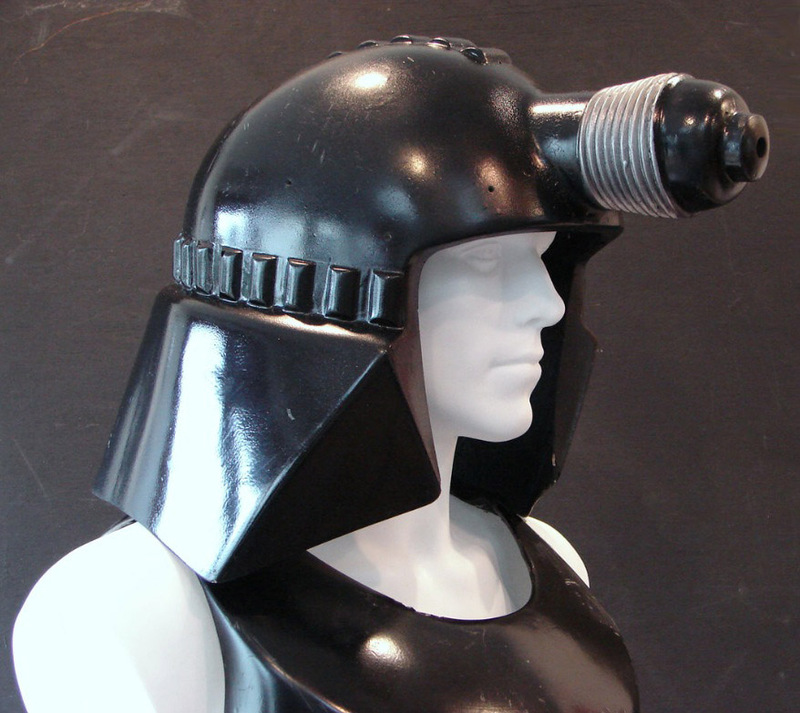 This makes the seven required on the helmet. All thats needed to complete this project will be a plastic liner from a site safety helmet (Hard hat) and the strips of coloured material placed in the chest. The paintwork could be all rubbed down and started again to make this showroom condition but I think that would lose the character it has built up over the years. The choice is the buyers. It is being sold in this state, as a renovation project. Please note the display mannequin is NOT included in the sale. 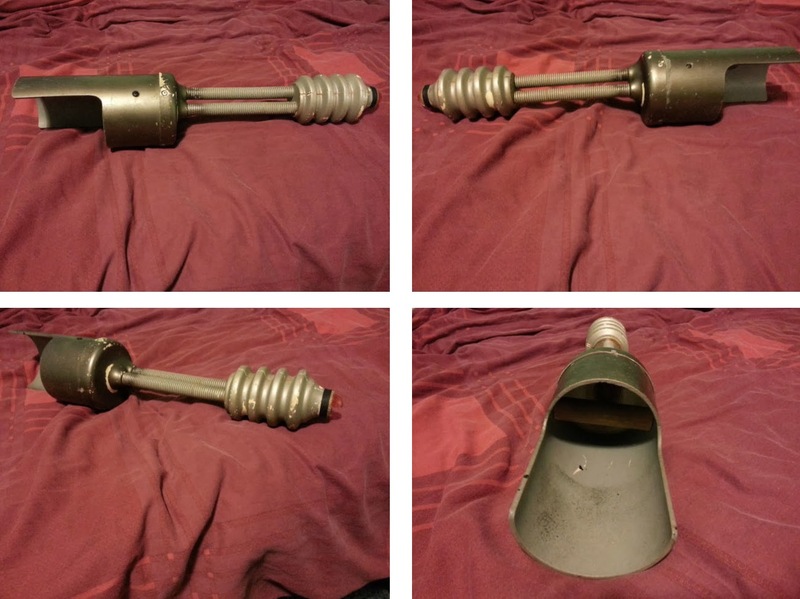 Screen used Dalek Trooper gun from Resurrection of the Daleks. Good condition but some wear due to age and exhibition use. The red 'lens' on the end has partially disintigrated but otherwise fully intact and original. Please note that this is not the 1 model built that lit up when fired. 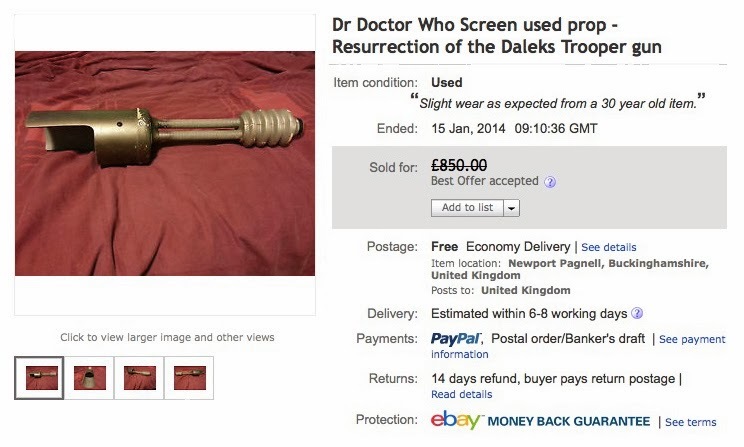 A rare chance to own a piece of Doctor Who and Dalek history! Are you still in contact with Stewart Evans of Sevans Models? I am currently building one of his Cybermen which is missing the decal sheet. By some miracle maybe he still has the art work so I can get a new decal printed. Long shot but you never know.